VW r&d boss Heinz-Jakob Neusser says the VW GTE concept's design embodies an alternative to traditional sedan segments by combining the functionality of a large hatchback with the interior space of a sedan. Volkswagen revealed its Sport Coupe Concept GTE on Monday ahead of media days at the Geneva Motor Show. The coupe-styled four-passenger sedan is similar in size to the Mercedes-Benz CLS and BMW 6-Series Gran Coupe. FRANKFURT -- Volkswagen previewed a coupe-styled sedan at the Geneva auto show that is set to become a production model to boost the brand’s image and attract customers from cars such as the Mercedes-Benz CLS. 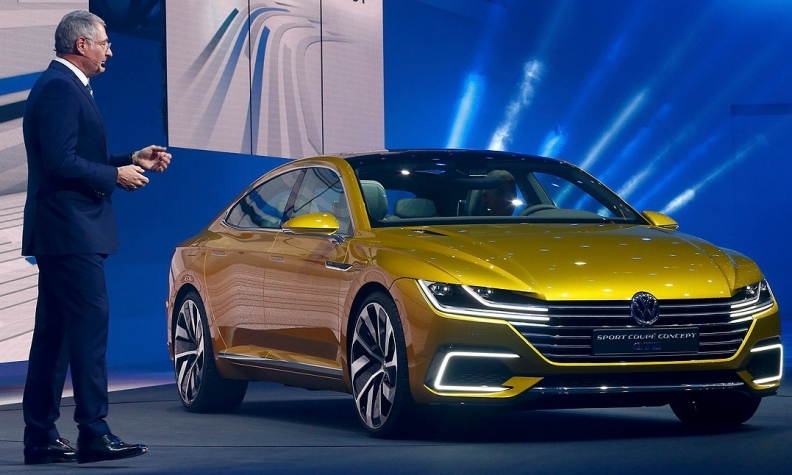 Klaus Bischoff, head of design for the Volkswagen brand, said the Sport Coupe Concept GTE is intended to be positioned above the current CC coupe-styled, four-door sedan. The concept was revealed at a VW event Monday in Geneva ahead of press days at the Geneva auto show beginning Tuesday. VW r&d boss Heinz-Jakob Neusser said the concept’s design embodies an alternative to traditional sedan segments by combining the functionality of a large hatchback with the interior space of a sedan. The Sport Coupe Concept GTE is based on VW’s modular transverse matrix platform architecture, also known as “MQB.” The concept’s exterior dimensions are similar in size to the Mercedes-Benz CLS and the BMW 6-Series Gran Coupe. The concept’s plug-in hybrid powertrain combines a 3.0-liter turbocharged V-6 with a 54 hp electric motor driving the front wheels and a 114 hp electric motor at the rear to create 374 total-system horsepower. The powertrain can switch between a default hybrid setting that delivers power from the electric motors and the V-6 as needed, a sporty GTE drive mode that can send the concept from 0 to 62 mph in 5 seconds and an all-electric mode that delivers “at least” 32 miles of emissions-free range on a full charge. It has a total range of 745 miles on a single tank of gas. VW says the concept also returns 118 mpg on the New European Driving Cycle. The car would fill a gap in VW’s lineup between the Passat midsize sedan and the brand’s Phaeton flagship. More than a decade ago, VW tried to close the gap through a technical partnership to use the Maserati Quattroporte’s rear-wheel-drive platform, but the project never made it past the initial statement of intent. VW again attempted to address the gap by launching the upscale Passat CC in 2008. The model later dropped the Passat in its name to differentiate it more strongly from the standard Passat, which starts at 26,075 euros (about $29,200) in Germany. The CC costs 33,700 euros (about $37,700). More than a decade ago, VW tried to close the gap through a technical partnership to use the Maserati Quattroporte’s rear-wheel-drive platform, but the project never made it past the initial statement of intent. The concept’s interior features a prototype 3-D digital instrument cluster with a 12.3-inch display and gauges that appear to hover. The center stack is topped with a 10.1-inch infotainment touchscreen, flanked by touch-sensitive slide controls for the car’s climate control system. Passengers in the back seat can control the infotainment system to browse through music files, operate the navigation and make calls via another 12.3-inch touchscreen mounted flat between the two rear seats. Images are also displayed for rear-seat passengers through touchscreens mounded on the backs of the two front seats. The concept can also select navigation routes to fit the mood of the driver by reading “biometric data” of the driver’s vital functions taken from a smart watch or similar device. A production model based on the Geneva concept would start at about 50,000 euros ($55,900), 22,000 euros below the German price of the Phaeton.